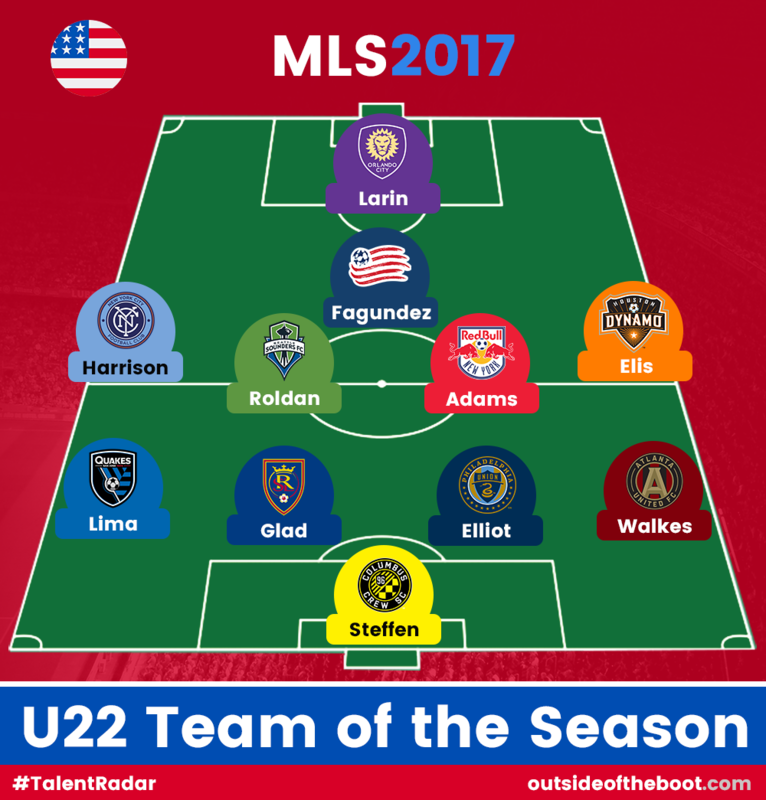 As the 2017 MLS season has finished, it is time for us at Outside of the Boot to recognize the accomplishments of tomorrow’s stars under our Talent Radar banner, with the U-22 Team of the Season feature. Zack Steffen // Columbus Crew // 22 // Goalkeeper: This was a tight battle that went back and forth between Steffen and Jesse Gonzalez of FC Dallas, but in the end, the man from Columbus, whose heroics have claimed crucial points at numerous times this season, including in the penalty shoot-out against Atlanta in the Cup Playoffs, won him the spot. Needless to say the USMNT is in safe hands with these two as keeper of the future candidates. Anton Walkes // Atlanta United FC // 20 // Right Back: Everyone had fun in Atlanta this year, but Anton Walkes was right in the middle of it. Despite being on loan from Tottenham Hotspur, Walkes was dynamic flowing on the right side of the pitch. He scored two and proved to have athleticism that was often times overwhelming. His passing thrived as well in this free-flowing Atlanta attack, and it will be a shame to see him go back to Tottenham, where he recently signed a new contract. Jack Elliot // Philadelphia Union // 22 // Centre Back: Jack Elliot finished third in the Rookie of the Year voting, and it’s easy to see why he got so close. The British centerback was an imposing presence in the back line, keeping opposing strikers in his shadow, which is a reference to his skill and his size. He was the second half of second half of a solid defensive pairing that served Philadelphia Union well all year long and he looks to have plenty to bank on going forward. Justen Glad // Real Salt Lake // 20 // Centre Back: Another unfortunate case of having a season disrupted by injuries, Justen Glad still managed to turn in a solid season in Real Salt Lake’s back line. He showed his impressive reflexes and anticipation as he snuffed out passing lanes and finished especially strong down the stretch for the Utah club as they failed to reach the MLS Cup Playoffs. Nick Lima // San Jose Earthquakes // 22 // Left Back: A homegrown rookie, 22-year-old Nick Lima had himself a year to remember in his first season in MLS. While injuries derailed what was shaping up to be a Rookie of the Year, if not All-Star as well, season, Lima still managed to chip in just under 2000 minutes, scoring two goals and adding an assist while proving himself to be a massively effective ball winner. In a league swarmed with talented fullbacks, Lima may be one of the rising best. Alberth Elis // Houston Dynamo // 21 // Right Winger: The Houston Dynamo went undefeated in the final seven games of the regular season to take a serious momentum wave into the MLS Cup Playoffs and Alberth Elis was right in the middle of all of it, scoring four goals in that span of games. The Honduran registered eleven goals and three assists in the year, playing across every attacking position, and looks to be among the best attackers MLS has to look forward to. Tyler Adams // New York Red Bulls // 18 // Centre Midfielder: You’d be hard-pressed to find a player in MLS that gets more people excited than Tyler Adams. That is only amplified by his rising relevance in the United States Men’s National Team, but for the sake of this MLS season, he was simply superb. It’s just ridiculous to think that he is only 18 years old, because he plays with the composure of a seasoned veteran. The Red Bulls do youth development right, and Adams is the premium example of that. He made 25 starts in MLS scattered across seven different positions, registering two goals and four assists spread across three different positions. Safe to say this guy does it all. Cristian Roldan // Seattle Sounders // 22 // Centre Midfielder: Everyone talks about Cristian Roldan, and there is a good reason why. He really is worthy of all the praise he gets. He is an enforcer if ever there was one. He averaged 3.5 tackles per appearance, which was right up there with the best in the league. And yet among all the ball-winning, he still found time to score six goals and chip in another two assists. Like Tyler Adams, Roldan did it with similar versatility, making 35 starts across six positions and spreading his goals and assists out across five of those positions. That is some special talent in this midfield. Jack Harrison // New York City // 20 // Left Winger: There is not a single thing, animate or inanimate, that Jack Harrison can’t dribble around. He is a wizard over the ball and it’s almost unfair to opposing defenders when they’re matched up against him. Harrison played 3000 minutes and continued right where he left off last year, proving himself to be one of the best young play makers in America and even beyond. He finished the year with ten goals and three assists, continuing to build up his growing relationship with superstar striker David Villa. Diego Fagundez // New England Revolution // 22 // Attacking Midfielder: Diego Fagundez has been relevant in MLS for so long that it’s fair to forget that he is still only 22 years old. New England continues to switch up their utilization of this young man, however, as he dropped into a deeper role, yet still managed his best season since his breakout 2013/14 campaign. He put up fourteen goal contributions, split evenly between goals and assists, and upped his defensive numbers to the best they’ve ever been to cope with playing deeper in the formation. Cyle Larin // Orlando City // 21 // Striker: The young Canadian has been on a steady drop off since he broke onto the MLS scene two years ago when he scored 17 goals in 1900 minutes. Since then he scored 14 last year and 12 this year, but in terms of goals per minute, that is still right about even, so perhaps Larin has found his sweet spot. It’s no secret that Orlando City struggled this year as well, tying for the second fewest goals scored. So to see Larin continuing to top their scoring charts by quite some distance is a testament to the quality he has despite the struggles around him.